The arrival of a new baby will always cause some disruption to the family but can and should be an enjoyable and joyous occasion. A smooth transition is helped immensely by being prepared. Whether in the kitchen with menu planning and stocking the freezer, preparing the children for the arrival of their new sibling, setting up a new routine, teaching your homeschooled children to work independently, or simply making sure there is a good selection of suitable activities for mat time, highchair time and table time will make life much easier for the whole family. 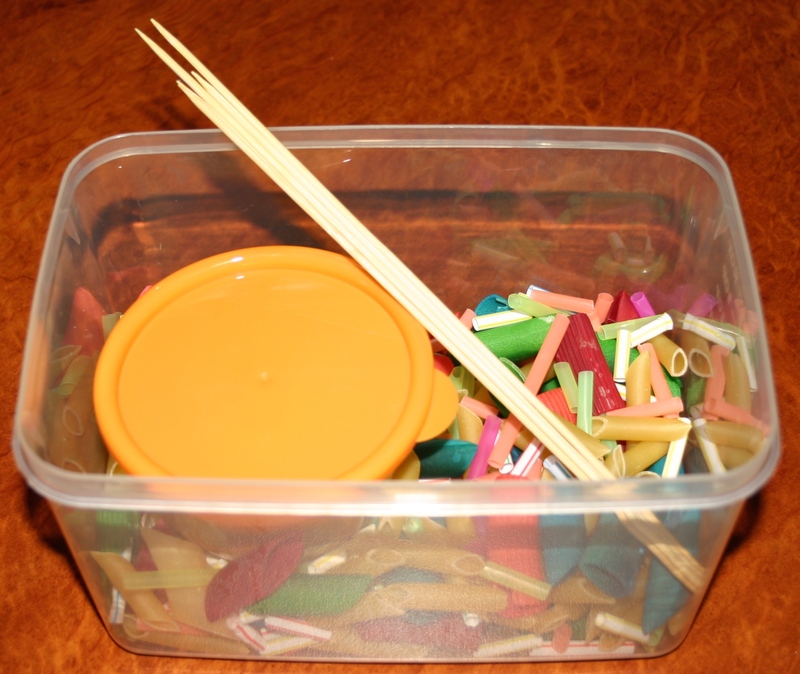 Today’s post is a peek into my 2 year old’s activity cupboard. He uses these trays after breakfast for highchair time while our preschoolers are doing their “school” work and the older children are completing their own school tasks. A good indicator that I have set up attractive materials is that both he and the twins have been pestering me daily about when they can do their school work! We are on holidays at the moment so while we do have some structure in our day, we are not dipping into the school cupboards until after the break so they are still fresh and interesting once the baby arrives. It’s killing them!! 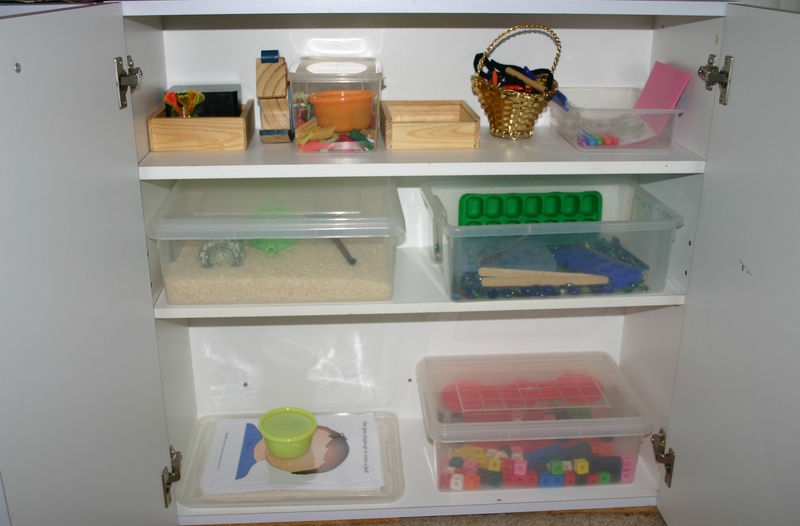 The great thing about a lot of these activities is that the preschoolers are interested in several of the toddler’s trays and vice versa. This gives them almost double the number of choices and will help keep them interested for longer before I need to swap out their cupboards again. Sensory tubs are always a hit. 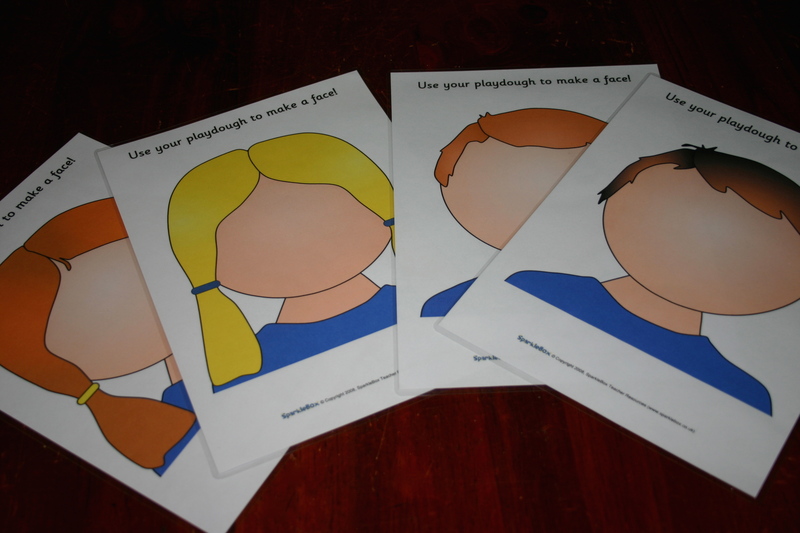 So easy to prepare and with open-ended play possibilities they should keep little ones engaged for some time. A tub of jewels with a variety of tongs and containers (pill boxes, ice block tray and chocolate box insert in this one) will be great for a week or two and can easily be made “new” again by changing the containers and tongs for something different. A variety of scoops, spoons, measuring cups, boxes, tins, jars, lids and anything else that can be tipped, poured, filled, opened and emptied will work well. Perhaps add a small teddy for pretend play fun. Our rice tray can be a sensory play tub or in this case a dry transfer activity. A small necked bottle, funnel and scoop are all that is needed for some filling and pouring play. Again, the contents can be very easily changed every week or two to keep things fresh. Threading, beading or lacing are all great for fine motor development. Young children find it difficult to push a floppy lace through. Starching the end of wool, using commercial threading laces with stiffened ends, tying the string to a thin dowel, taping the end or any other method of stiffening the thread will make it manageable for young children. This is a small piece of dowel with a hole drilled in the end. The shoelace is glued into the hole, proving a strong length that allows a chubby toddler hand to hold the wood and fit a bead onto it at the same time. Don’t forget to tie one of the beads onto the end of the string to stop the rest rolling off onto the floor. Storing the dough in the small orange plastic container means the lid can be popped back on to stop it drying out. 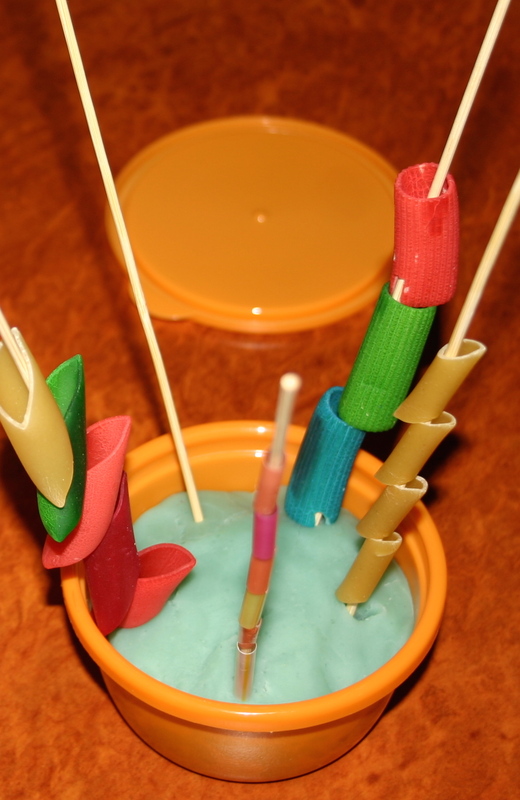 Once the toddler has seen it once, poking the skewers in will be part of the attraction. Basic puzzles are great. 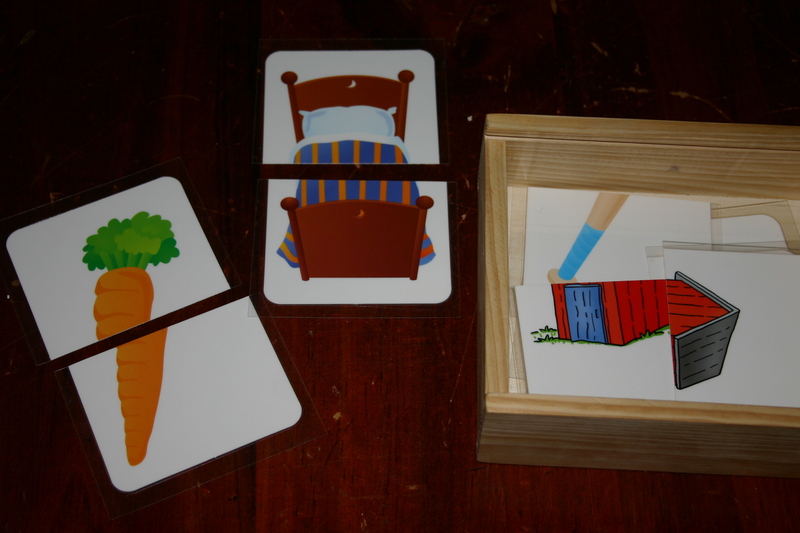 Matching picture halves make a good starting point for a child who is too young to be able to complete a regular puzzle. These are laminated playdough mats. With another small tub of dough the child can add a face, hair etc. Free printable available here. 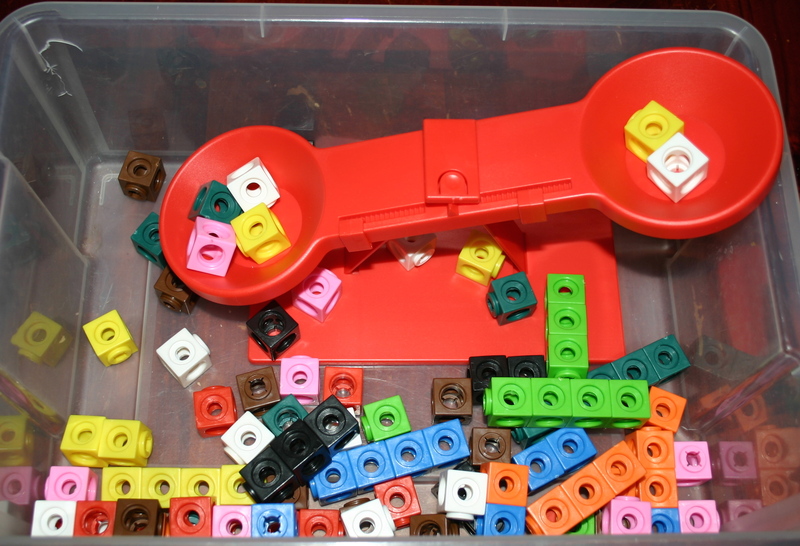 Free experimentation with a basic set of scales and blocks will develop a child’s understanding of heavier, lighter, more, less, up and down and other mathematical language. Older children will tend to count, predict and experiment in a more sophisticated way. What does your toddler love to play with? Oh my daughter will love the scales and blocks. Haven’t been able to find such weighing scale though. Ours came as part of a maths kit. Don’t know that I would invest too much financially into a set as the concept is fairly simple and won’t be a long term use item. Love your creativity with finding regular household things that become great free play. Do you ever dread the clean-up? Any tips? Thanks, I enjoy it. With the highchair/mat time/table time equipment clean-up is very easy – only one tray out at a time and the next one doesn’t come out until the child has packed up. We train our children from an early age to pack up after playpen time and it just follows on from there. If you mean my pack-up when I change trays then yes, you need some kind of storage system so it’s not too complicated to get all those containers and what-not put away. but I loves your ideas…where do you buy your containers …for busy boxes? and supplies about our God…”Let your roots grow down into Him, and let your lives be built on Him. then your faith will grow strong in the truth you were taught, and you will overflow with thankfulness”. [colossians 2:7]. “BE THE CHANGE YOU WANT TO SEE IN THE WORLD” (Mohandas K. GANDHI ) (Let’s get started..GET MOVING…now, don’t wait until tomorrow if you can be a blessing today, share your gifts, talents, your blessings with those around you. That is why God gave them to you! That is why He called us to live as a community). Hi Renata Thanks for your comments. I buy the busy boxes from Big W – I think the brand is Starmaid? Bits and pieces to go in them are collected from secondhand shops and discount variety stores mostly. I keep my ideas for the future on Pinterest and then just pick up the bits and pieces as I see them.